This title refers to the Beast in Revelation 13. He is the system that corrupts mankind both religiously and socially. He makes war with the saints and destroys any who will not give allegiance to him. The Beast is gloating over what he has done to Agnes both physically and conceptually. In destroying her, as a martyr, he has elevated her to "canonization" within the very system he represents. Placing a dead saint on a pedestal, as an intercessor or mediator to God, is a blasphemy that negates the role of Christ. Scripture says, "There is one God and one mediator between God and men; the man Christ Yesu." (I Timothy 2: 5). Somehow the Beast is saying, "You would not surrender to me. Now, I have taken your life, and I will use you to take the lives of others." This sculpture was created as a Hollywood movie prop for the upcoming Paul Saint Paul film titled St. Agnes. In the story line, a college student named after St. Agnes is building the sculpture in her apartment. She calls her construction "St. Agnes," after her patron saint. According to one account of the legend Agnes was beheaded for her loyalty to God and the virtue of chastity. 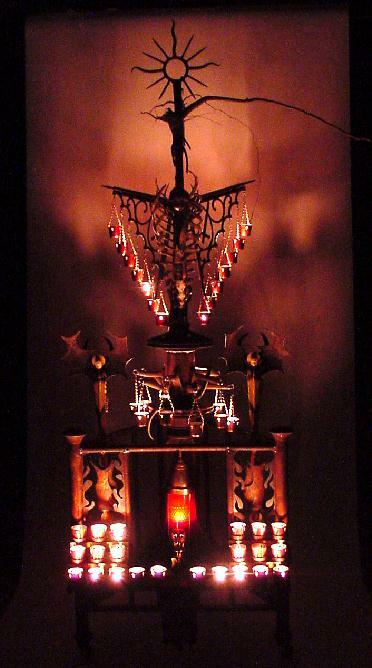 In the sculpture the severed, screaming head of Agnes is perched atop a reliquary within the innermost parts of the Beast. This symbolizes the beheading of the saints who refuse to worship the Beast (Revelation 20: 4). The name Agnes is from the Latin agnus, meaning, "lamb." So in a sense, St. Agnes represents the steadfast flock of the Good Shepherd. In the film, Agnes overcomes her persecutor, lending a morbid ending to the story as she places the finishing touch to her sculpture. You will not see it here. It is not yet in the sculpture. You will have to wait to see it in the movie (calendar date not yet determined).